Exercising the vote: 5,602,973 (98% of the list of voters). Leaving the ballot blank: 44,221 (0.8% of those who exercised the vote). Annulling the ballot: 31,148 (0.5% of those who exercised the vote). Marked ’NO’ on the ballot: 54,070 (1% of valid votes). Marked ’YES’ on the ballot: 5,473,534, 97.7% of the valid votes. Adding abstentions, blank ballots, cancellations and negative votes, 243,732 citizens, that is, just over 4%, did not express their approval of that Constitution. Undoubtedly, an overwhelming triumph for the ruling party. Almost every one of those participants, today, is over 60 years of age, which means that a good number of them have died and others (including many of those who voted Yes) may have made the decision in these 42 years to not continue living in Cuba. Among the voters who will participate the next constitutional referendum, scheduled for February 24, 2019, those who are first-time voters in this type of popular consultation will be the majority. Among them is the current president Miguel Diaz-Canel, who turned the statutory 16 years to vote on April 20, 1976, two months after the previous referendum, so he was not able to vote in it. Unlike the mass of voters who subscribed to the 1976 Constitution, in the consultation next year, the number of those who had some participation in the fight against the previous dictatorship of Fulgencio Batista will be very small, there will be very few who fought at Playa Girón (Bay of Pigs), or in the fight against the rebels, and there are also very few who had some experience in the internationalist missions of Angola or Ethiopia. Of course, most of the more than eight and a half million Cubans who will have the right to vote in the next referendum have relatives outside the island and a relationship to them. Almost no salary is enough to support a family, and in both absolute and relative terms we can say that today there are more people who have traveled abroad, and who publicly express their religious beliefs or their sexual preferences, both inadmissible in 1976. The Cubans of the 1970s depended exclusively on the salary provided by the State and on what was distributed by the rationed market in an equal manner. Any domestic appliance, from a washing machine, a refrigerator, or a Soviet television, could only be acquired through a bonus, granted by virtue of the social and labor merits accumulated during the year. Those Cubans of the 1970s only knew what was happening in their country and in the world through what the state newspaper Granma told them, or from state radio and television, while they found some glimpses of criticism in the Noticiero del ICAIC by the curator Santiago Álvarez. 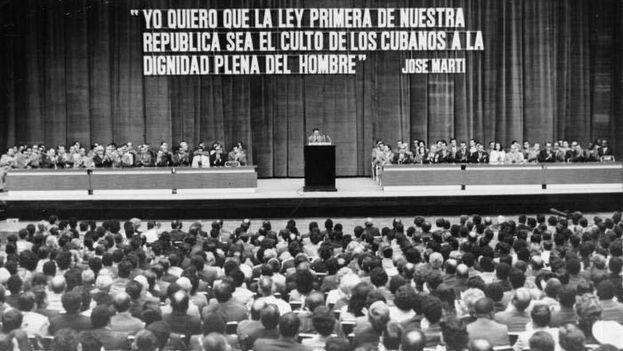 At that time they were not able to listen, even with interference, to the US-based Radio Martí transmissions, and foreign publications were limited to those from the socialist countries, which were sold in the news kiosks in an authorized manner. To put it briefly, today’s is another electorate, with greater economic independence arising from remittances from family abroad and self-employment; notably influenced by social networks, the weekly packet, independent journalism and with a greater amount of frustrations in the face of the accumulation of government promises unmet. An electorate happily freed from the hypnotic influences of its former charismatic leaders, increasingly critical of its rulers, with ever more appetite for freedoms. It must be recognized that the Government assumes an enormous risk in submitting a referendum on a Constitution that does not satisfy the majority of Cubans, although they have been forced to do so for multiple reasons, some obvious, others not confessed. The truth is that the 1976 text, today, is incompatible with the reality of the country and with the timid reformist intentions. The dirt already thrown on the 1976 Constitution, to justify the writing of a new text, makes it impossible to resuscitate it or stay with it in the event that the electors decide to say a massive and forceful ’NO’ to the new proposal. The Constitution approved by Parliament on 22 December 2018 is a perfect fit for the Government’s plans, but it is far from satisfying the demands of citizens. It is true that the text has changed. What happens is that the electorate has changed more than the government. Previous Previous post: Raul Castro: "The Transfer to the New Generations is Going Well"